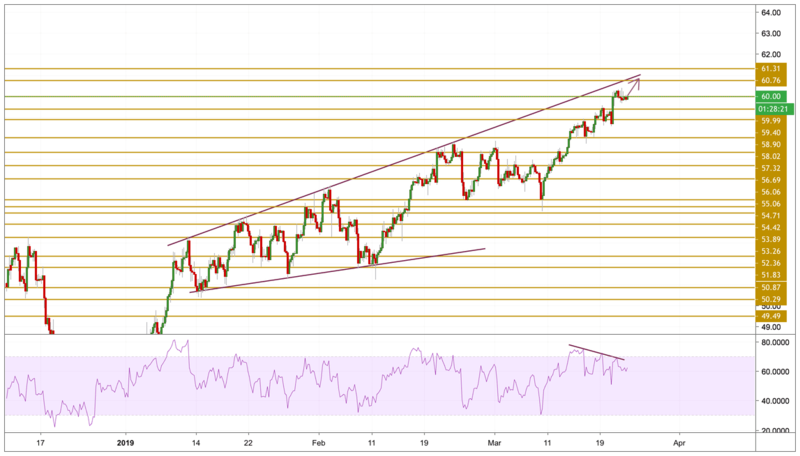 The energy benchmark is struggling with the 60 handle since yesterday's session as doubts over economic growth amid trade tensions grab investor attention. Depleting inventory levels join supply cuts from the OPEC+ alliance in order to help the oil prices portray recent upward trajectory. Whereas the US sanctions over Venezuela and Iran act as an additional force to the upside. However, concerns for a trade deal between the US and China, coupled with weakness in manufacturing global PMIs, challenge the WTI strength. Looking forward, the US Baker Hughes oil rig count could offer fresh directions to the price moves. WTI prices retreated from the highs of $60.30 per barrel after struggling to find the right momentum to continue surging. The price is currently hovering around the 60 handle with the RSI still showing a bullish but decreasing momentum with a divergence. If the price could hold to this level, we expect the continue of the upward move and the next level we will be focusing on is the 60.76 resistance level.